Don't Inspect for Pests - Sued Anyway? Even if your inspection specifically excludes wood destroying insects/organisms (WDI/WDO), you are not protected from an irate homeowner suing you if a problem arises. That’s why it is good to have a clear scope of work, a signed inspection agreement and a broad errors and omissions insurance policy- just in case. 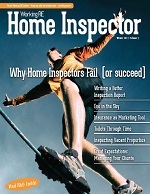 According to David Brauner, Senior Broker at insurance provider OREP.org, most inspectors who don’t inspect for WDI/WDO probably don’t think they need to purchase the coverage. So if a problem arises, they may be left on their own. Brauner says that OREP’s E&O base policy provides what is known as “incidental” coverage for pests and many other services- for when a problem like this arises. “That’s why a broad policy form is so important,” said Brauner. Brauner recommends asking your agent when you’re shopping insurance about what is and isn’t covered in the base policy- whether you specifically inspect for it or not.